Lots of new veggies to try this week! Most excitingly the long awaited summer favorite is here, tomato season is upon us. We have a few pounds of potatoes for everyone. We also have a new vegetable for many of you, the southwest favorite Tomatillos. This green husked vegetable, comes from the tomato family and is excellent for salsas. Also for full shares we have a conventional favorite, Cauliflower. 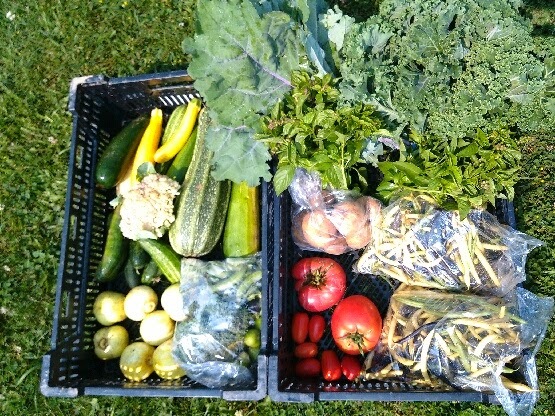 IF YOU WOULD LIKE EXTRA WE WILL HAVE A LIMITED AMOUNT FOR SALE AT DROP OFF OR AT THE FARM OF: BEANS, SQUASH, and CUCUMBERS. NEW THIS WEEK! Boil em, Mash em, Stick em in a stew! You will be receiving a few pounds of potatoes this week. These are a Yellow and Red variety of potatoes. One of our favorites is Potato Salad. Or pick up a dozen Shire Farm Eggs, and make a potato and egg scramble for breakfast this weekend! NEW THIS WEEK! We have the first tomatoes of the season, some Roma variety tomatoes for everyone this week. Full shares will also receive a large slicing variety tomato. Below is a link to Farmer Figgins' post about all the varieties you will be seeing this season. The Roma tomato is a versatile variety with lots of flesh that can be used for salsa, tomato sauces, or even as a sliced or diced raw tomato. The large slicing tomatoes are great for a BLT Sandwich. NEW THIS WEEK! This is a new crop to us this year, but one that was a favorite of many of the farmers Farmer Figgins learned from out in Colorado. This interesting vegetable is related to the tomato and must be removed from it's papery husk before use. It can be used in many of the same ways as a tomato either in sauces or green salsas. New This Week! Full shares only, This was a crop that struggled last year, and this year has been struggling with some insect damage. Yet we do have some getting ready this week and will be including this crop with full shares this week. This like broccoli is a very versatile and commonly used vegetable. Can be eaten raw, steamed, sauteed, or can even be mashed like potatoes. One interesting choice is to make them into crispy patties which I've linked to a recipe for. This is probably Farmer Figgins favorite specialty crop we grow. This is an Heirloom variety of cucumber that doesn't grow large green fruits. Instead theseo small apple sized cucumbers have a bright yellow skin. They make a fantastic snack with no clean up because the entire thing is edible and delicious. They can also be used to make your favorite cucumber salad recipe. These were a new vegetable to many last year, and hopefully our new shareholders will enjoy them as much as everyone did last year. More snap peas this week, enjoy this short season favorite. Best enjoyed as a raw snack or as a bright tasting addition to a stir-fry. The Green Beans are wearing out Farmer Figgins, who harvested more than 60 pounds of green beans this week. We will have extra beans available, and this is a easy and really great vegetable for storing. We are growing a mix of varieties this year so you will be seeing a mix of Green, Purple, and Yellow Green Beans throughout the season. This summertime favorite is loved by almost everyone. Raw they are very tasty but there are all sorts of ways to prepare this veggie. Last night we fried them up in a little butter with pepper and garlic. Steam them, bake them, bread and fry them. You can also pickle these along with a few cucumbers! The cucumbers are up to the ceiling in the green house and the fruit keeps coming. The crops outside were beleaguered by insects all spring and were a bit behind but are beginning to come along, so hopefully we won't be seeing an end to this summer favorite anytime soon. This green became a favorite for us at the farm Farmer Don certainly came to love it, despite thinking it was a food fad orighttps://www.blogger.com/blogger.g?blogID=6807730126465406260#editor/target=post;postID=3282569720923863314inally. There are many great ways to enjoy this super food, which is loaded with vitamins. You can of course you can eat it raw, or throw it in a juicer. We really enjoy throwing it in the cast iron with butter, salt, pepper, and some red pepper flakes and sauteing for a few minutes for a great side to any meal. It is also a great healthy snack when you bake them into Kale Chips. We've got bunches of Tarragon and Lemon Basil this week, enjoy!